If you’ve been wondering what to do with all the leaves on the ground these days… we have a fun and super simple solution for you. I wrote this article for Pre-K pages this month and thought I would share it with you too. While crafts are great for kids, they also need the opportunity to create art without there being a right way or a wrong way to do it. 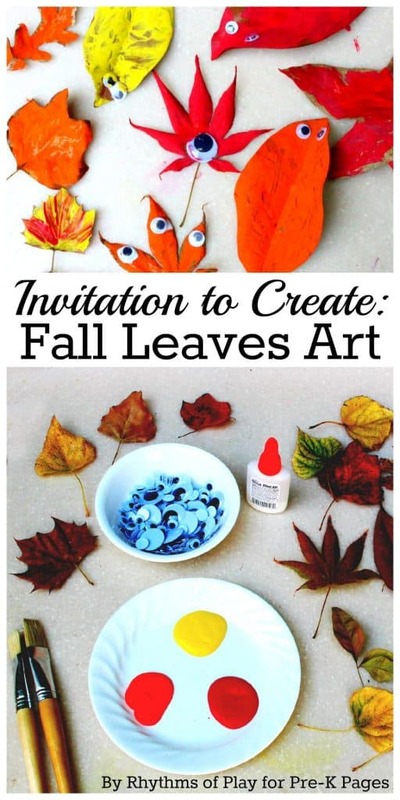 For all the details on how to set up this invitation to create fall leaves art, click on the link and head over to Pre-K Pages. You will find everything you need to get started and more! For more ideas follow me on Pinterest… I’m always on the lookout for kids art projects of all kinds. Follow Nell @ Rhythms of Play’s board Kids Art on Pinterest.